Karu J stirring pot to clinch UNP presidential candidacy? The constitutional gridlock that gripped the country since October 26 showed signs of coming to an end with the President telling the UNP and their allies when they met in at the Presidential Secretariat on Thursday that they should firstly remove from the no confidence motion presented by the JVP the first clause which declared ‘unconstitutional and illegal’ the dismissal of Mr. Ranil Wickremasinghe and the appointment of former President Mahinda Rajapaksa as the Prime Minister because that was within the powers vested in the President by the Constitution and secondly, to pass the no confidence motion against the incumbent Prime Minister in accordance with the provisions of the Constitution and Standing Orders if they had the numbers in Parliament. This meeting on Nov. 15 between the UNF and the President took place in a situation where the incumbent Prime Minister Mahinda Rajapaksa had addressed Parliament that day even amidst heckling. So it was only a matter of wording the no confidence motion properly and adhering to the laid out procedures in presenting and passing it. However, Speaker Karu Jayasuriya suspended the Standing Orders of Parliament on a motion from the floor and then claimed to have taken a voice vote to pass the first no confidence motion. Incongruously, he also refused to acknowledge that there was a new Prime Minister and Cabinet and in allocating time for MR to speak, he had referred to the latter as ‘manthreethuma’! If there was no Prime Minister, who were they passing a no confidence motion against? The Speaker then proceeded to send a letter to the President stating that the no confidence motion had been passed and attaching to it an old list of signatures with the date changed from 2 November to 14 November as the ‘signatures’ of those who were in favour of the no confidence motion. The UNP is supposed to be a party of kultur, tie and coat types and they of all people should know how to prepare a proper document which can be accepted. After observing the events of the past few days, and knowing the characters involved, the conclusion that this writer has arrived at is that Speaker Karu Jayasuriya is deliberately stirring the pot in order to play hero among UNPers so as to bag the Presidential candidacy in 2019. After the President spoke to the UNF on Nov. 15 and arrived at the understanding that the first clause in the no confidence motion would be removed, and the motion passed according to the Constitution and Standing Orders of Parliament, what Karu J did next on (Friday Nov. 16), was once again to suspend the Standing Orders and in the resulting uproar, to claim that the no confidence motion had been passed by a voice vote a second time. In a situation where some UNF members had publicly expressed the view that a breakthrough had been achieved after the discussion with the President, there was certainly no need for the theatrics of Friday. It would have taken only a matter of days to fast track a proper no confidence motion through Parliament according to the standard procedure. Instead once again Karu J did exactly what he did the previous day. The only concession that Karu made to the understanding arrived at with the President was to call for the removal of the first clause in the JVP’s no-confidence motion. Karu J has not adhered to the understanding arrived at with the President possibly because that will not give him an opportunity to remain in the limelight. Even on the second day (Friday Nov. 16), all those who saw these proceedings on TV could see only chaos and hear a cacophony of sound and it was obvious that no proper vote was taken. It’s hardly surprising that on Friday night as well, the President once again refused to accept the result of the second purported no confidence motion. The sight of Speaker Karu Jayasuriya sitting on a chair in the well of Parliament and bellowing into a hand held microphone for Hon. M.A.Sumanthiran to present the motion to suspend the Standing Orders to start the day’s proceedings and finally claiming that a no confidence motion had been passed by voice vote in the midst of an incoherent cacophony of sound was one of the most unedifying spectacles ever seen in Parliament. One of the reasons for the unrest that erupted in parliament on Friday the 16th was that the Speaker took no action against parliamentarians Palitha Thewarapperuma and Ranjan Ramanayake over the allegation that they brought knives to Parliament. At least one of them was caught on camera brandishing something. On previous occasions, Wimal Weerawansa and Prasanna Ranaweera were suspended from Parliament for mere verbal offences. Had Thewarapperuma and Ramanayake been arrested and taken before a magistrate there would have been no need for the other side to protest on Friday. When Major Ajith Prasanna was assaulted outside Temple Trees by two MPs including, Thewarapperuma, the police took action within 24 hours and the matter is no longer an issue. That is what should have happened with regard to the complaints against Ramanayaka and Thewarapperuma as well. One gets the distinct impression that Karu j is deliberately stirring the pot to keep himself in the limelight for as long as possible obviously with a view to making himself a possible contender for the UNP’s presidential candidacy next year. Karu J was at the tail end of his career and if not for this crisis which has catapulted him into the limelight and given him an opportunity to play the role of a heroic champion of the UNP cause, he may have had to fade away from politics after the next Parliamentary election. There would have been little point in him contesting the next parliamentary election because he would have been just another MP if the UNP loses. Even if the UNP won power again, he would have been relegated to the level of a ‘senior minister’ with no real role to play in government. So his last chance is to make a pitch for the presidential candidacy of the UNP and that seems to be what he is doing by his totally unnecessary theatrics in Parliament. There is no doubt that his stock among UNPers has gone up because they now see him as ‘ape kathanayakathuma’. 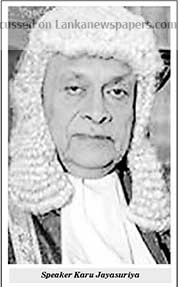 What Karu Jayasuriya is doing now is reminiscent of what the former High Court judge P.B.Warawewa did during the White flag case against Sarath Fonseka. Judge Warawewa came up for retirement while the ‘White flag case’ against Sarath Fonseka was being heard. He was given an extension of service to complete hearing that case. Warawewa gave a dissenting judgment against the conviction of Sarath Fonseka and went into retirement when his service extension expired. Almost immediately he became an opposition politician and he invited the people to ‘gather around him’ to fight for justice! Can anyone have the slightest doubt that Warawewa’s dissenting judgment in the white flag case had little to do with justice or the law and had more to do with the need of the former judge for a retirement job? Similarly, Karu Jayasuriya’s present actions are not designed to benefit anyone but himself. This is why he is so insistent on doing what is calculated to focus attention on himself rather than to solve the problem at hand. If he does not get the police to take some action against Ranjan Ramanayake and Palitha Thewarapperuma at least before Parliament meets on the 19th, then we’ll know that he is looking for more trouble and more publicity. Tutorial on NCMs from PM’s Office! 1. A no confidence motion against the Prime Minister has to be handed over to the Speaker and the motion should contain the signatures of at least 20 MPs. 2. The Speaker should refer it to the Secretary General of Parliament for its legality to be checked and the Secretary General should report back to the Speaker that the no confidence motion is in accordance with the Constitution and the Standing Orders of Parliament. 3. It has then to be included in the Order Book of Parliament and the Order Book has to be printed on a Friday and circulated to all the Members of parliament. 4. After the lapse of five working days, it has to be taken up for debate. 5. The Committee on Parliamentary Business has to decide on the priority that is to be given to the items on the agenda. This Committee on Parliamentary Business has to be headed by the Speaker and include the Leader of the House, the Chief Government Whip, and MPs representing the Government. Also represented in it will be the Leader of the Opposition, and MPs representing the opposition. The Deputy Speaker and Deputy Chairman of Committees are also ex-officio members of this Committee. 6. When a no confidence motion of this nature is presented, the first possible date for it to be taken up for debate will be decided on with the concurrence of the Leader of the House and the governing party. 7. Thereafter, it should be included in the agenda and the date of the debate notified. 8. After the debate is held and a vote taken, the proceedings have to be published in the Hansard. When the JO presented a motion of no confidence against the previous Prime Minister Mr. Ranil Wickremasinghe earlier this year, all these procedures had been adhered to, to the letter. Readers will remember that when the no confidence motion against Mr. Wickremasinghe was handed over to the Speaker in April this year, it had the signatures of 51 Joint Opposition MPs and four SLFP Parliamentarians and everything else had also gone according to the book. The four SLFP MPs who had signed it were T.B. Ekanayake, Nishantha Muthuhettigama, Susantha Punchinilame and Kader Masthan. Even though the no confidence motion against Mr. Ranil Wickremasinghe was put through all the correct motions and nobody complained that the due procedure was not followed, the no confidence motion that is supposed to have been passed against Mahinda Rajapaksa has not adhered to any of these procedures. How does one justify this difference? We saw the manner in which JVP Parliamentarian Vijitha Herath went up to the Secretary General of Parliament and handed him a paper and went back to his seat. Then M.A.Sumanthiran moved a motion to suspend the Standing Orders of Parliament and the Speaker then proceeded to call for a vote on the no confidence motion which neither he nor the Secretary General of Parliament had even read. What has happened with regard to the no confidence motion against Prime Minister Rajapaksa is that the Speaker has politicized it for his personal benefit. The Speaker holds that he does not recognize Prime Minister Rajapaksa and the new cabinet appointed by President Sirisena. If there is no Prime Minister, who is he passing no confidence motions against? It is not the business of the Speaker to give recognition to Prime Ministers or Cabinet Ministers. The President appoints the Prime Minister and the Cabinet and if a no confidence motion is brought against a Prime Minister so appointed, it has to follow the correct procedure. If the correct procedure is followed it would have taken only a few days, perhaps two weeks at most for the process to be over. But the speaker is obviously playing to the UNP gallery with a view to the presidential candidacy and that is where all the problems stem from. Karu Jayasuriya has in a way painted himself into a corner by stating in Parliament that he does not recognize Mahinda Rajapaksa as Prime Minister. To pass a no confidence motion against a PM he has first to be acknowledged as the duly appointed PM and then Parliament has to declare that it has no confidence in the Prime Minister so appointed. But when you try to bring the politics of the street into parliament and declare that there is no Prime Minister and cabinet and then proceed to pass no confidence motions against a non-existent PM and cabinet, a gridlock naturally occurs. The events that took place after October 26 have undoubtedly benefitted the Joint Opposition which for the past three and a half years, had less time to speak in Parliament than the JVP even though they had nine times the number of MPs. Now suddenly, the number of MPs identifying with what was known as the Joint Opposition has increased from the original 53 plus 15 to over 100 due to the reunification of the UPFA and some crossovers. The TNA and JVP which had been masquerading as a part of the opposition were revealed to the public as an integral part of the UNP alliance. Due to President Sirisena breaking ranks with the UNP, the yahapalana government lost its two thirds majority in Parliament which was one of the main objectives of the Joint Opposition. The yahapalana side lost the support of the President and that camp has been cleaved in two. The UNP will also no longer have access to the executive powers of the President and the latter can prevent the UNP from doing any permanent damage such as signing ill-thought-out FTAs and selling valuable government property. Most importantly, the stage has been set for the reunification of the SLFP and SLPP at village level. The SLFP too has a certain number of elected representatives at the local government level and those already elected to seats can continue to hold them and a power sharing arrangement between the two factions can be arranged on an agreed formula. The present conflict has helped cement the ties between the two factions though a common struggle. The UNP led alliance now has less MPs than the JO led alliance. Any majority they show in parliament will be by leaning on the TNA and the JVP which will extract the maximum from the UNP for their support and even if they form a government again, they will only be able to limp along till the end of their term amidst the demands being made by both the JVP and the TNA. We all remember what happened in 2001 after the Chandrika Kumaratunga government entered into a ‘pariwasa’ arrangement with the JVP in 2001 – it hastened the downfall of that government. Thus even if the UNP manages to get a proper no confidence motion passed against Mahinda Rajapaksa and even if the Supreme Court declares the dissolution of Parliament unconstitutional, and the UNP gets to remain in power for the rest of the term, the position that they find themselves in will be so unviable that they would be better off agreeing to dissolve Parliament and going in for a general election. With former President Mahinda Rajapaksa taking membership in the Sri Lanka Podujana Peramuna and formally assuming its leadership, after the President issued the proclamation dissolving Parliament, the new party comes into its own as the main political party in Sri Lanka in a new two party arrangement with the UNP as its opposite number. That what is on most people’s minds is not what is happening at present but the next general election was shown by the fact that the cricketer Tillekeratne Dilshan took membership in the SLPP in the midst of the chaos in Parliament. Most people seem to be thinking of the next Parliament, not the present one. The SLPP with its pohottuwa symbol created world history when it became the first political party in a mature democracy with a well-established two party system to dislodge the two established political parties to become the largest political party. After universal suffrage was introduced to the world, several countries mainly in the developed West evolved two party political systems with Sri Lanka and India following suit after independence. If we define a mature democracy as a country that has had universal suffrage and an established two party system for more than half a century, there are not many countries that will fit that criteria outside the West and Sri Lanka is one of them. Until the SLPP proved it wrong, conventional wisdom had it that no one could upstage the two main political parties in a mature democracy. The first time that this conventional wisdom was called into question anywhere in the world was during the Brexit referendum in 2016 when a campaign led by the UK Independence Party managed to prevail over the Conservative Party, the Labour Party and the Liberal Democrats who all officially sided with the remain campaign. However where the Brexit revolution differs from the SLPP’s rise is that the Brexit vote was a referendum which though ideologically led by fringe political parties like UKIP, had significant segments from the Conservative Party and the Labour Party taking a contrary position from their political parties and campaigning for Britain’s exit from the EU. This support from whole blocks of the traditional political parties played a major role in providing the critical number of votes for the Brexit camp to win. Since the referendum, the Brexiteers among the traditional political parties have since gone back to their political parties and now Britain is back to the old two party system. In Sri Lanka however, what the SLPP won was an election, and nothing will be the same again after the drubbing that the two main political parties suffered at the hands of a political party that had been founded less than a year earlier. For all intents and purposes, the SLPP is the political party of the Rajapaksas just as the UNP and the SLFP were the political parties of the Senanayakes and Bandaranaikes respectively. ← JKH share repurchase offer pushed by institutional shareholders Will existing shareholders opt for cash or look for value down the road?